The CPM® designation is a career-long commitment that demonstrates to current and potential employers, peers and clients that Grant Lee has mastered core marketing knowledge and principles. It also shows his dedication to staying current in the marketing field and upholding the highest professional standards. Attaining the CIMMO CPM® designation indicates that Grant Lee has met strict criteria established by the CIMMO’s Registrar. 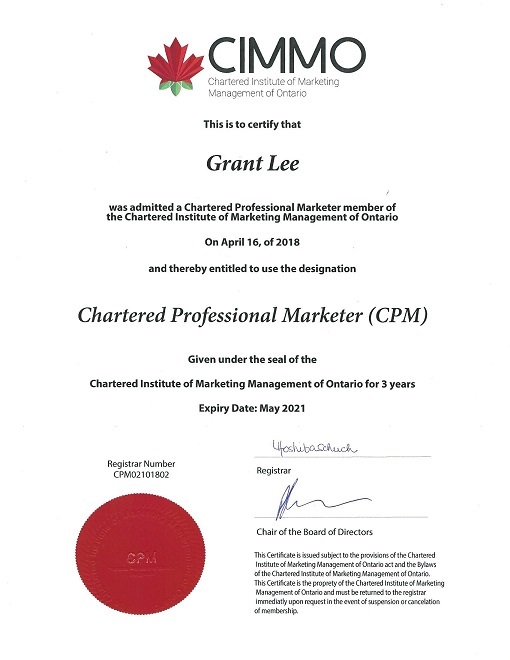 To maintain the CPM® designation, Grant Lee is required to pursue ongoing marketing education and growth and to recertify every three years.